It’s often only as the evenings shorten and the heating comes back on that we begin to notice our energy bills again. But thinking through your options when the sun is (hopefully) shining means you will save when the cold months kick in. Got an Old Oil Boiler? Around 70% of homes in Northern Ireland use home heating oil – but many oil boilers have been installed for years, if not decades. If your boiler is more than six years old (and certainly if its ten or fifteen years old) it will be worth replacing with a modern condensing boiler. These boilers can have efficiencies of around 95% while older boilers may only be 60–65% efficient. An old oil boiler may be only 60%-65% efficient which means for every £100 spent on oil £35 – £40 is wasted. Cost of replacing your boiler and what help is available? No-one likes the idea of forking out on a new boiler but the annual savings and support available may mean it is the right decision. A new boiler can cost between £1,180 and £2,410 depending on what you need for your home. There are a range of grants to help with the cost – the boiler replacement scheme can provide up to £1,000 towards the cost of installing an energy-efficient condensing oil boiler. The Northern Ireland Sustainable Energy Programme (NISEP) has recently launched for 2017/18 with many schemes its helping with the cost of replacing old heating systems. For more information see our Energy Grants and Assistance section. Many installers and manufacturers also offer 0% interest free loans. For oil boilers you should only use an OFTEC registered installer. OFTEC keeps a register of all suitably qualified, reputable oil engineers. So when you choose an OFTEC registered technician you will have peace of mind that the engineer is trained, qualified and accredited to do the work. 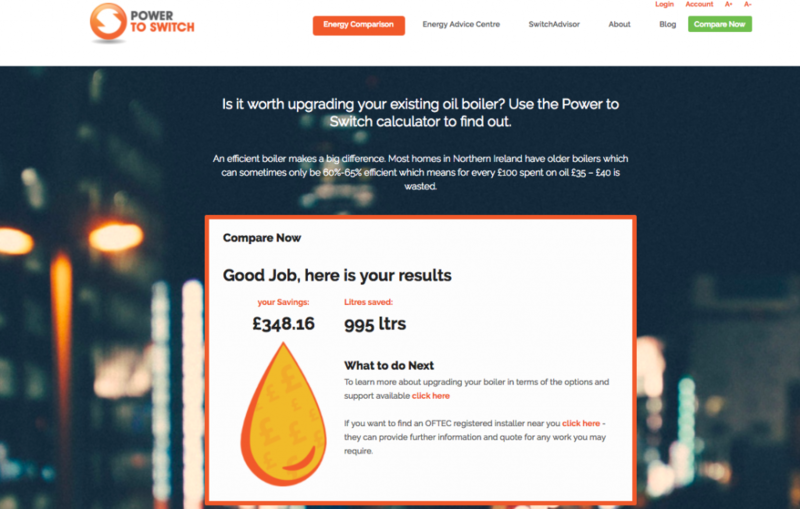 Use the ‘Power to Switch’ Oil Boiler Comparison to see how much you could save by upgrading your oil boiler. Check out all the support and assistance you are eligible for to help reduce the cost and remember to shop around for the best quote.